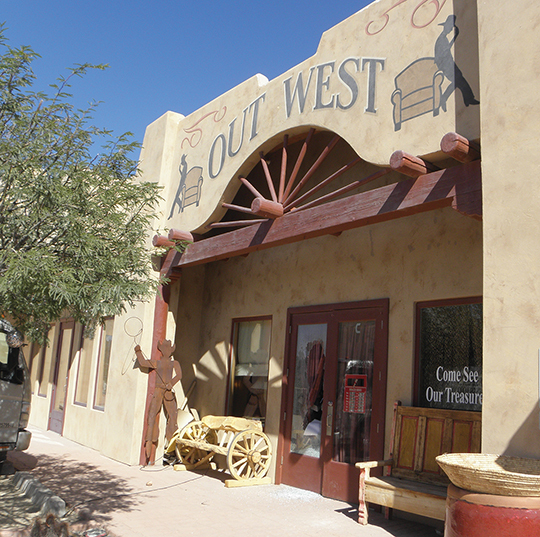 CAVE CREEK – Out West Interiors has expanded, added more artists, has more furniture and accessories and customers love it! “We have 20 new artisans,” Beverly Sexton reiterated. Beverly owns and operates the store with husband Robert, who upholsters, and son Zack, so it’s truly a family affair and their clientele appreciates that. “And we have lots of new artwork,” she added of the impressive (and oversized) paintings. The Sextons’ goal is to offer American-made furniture and accessories by local craftsmen. Shoppers now have the choice of even more mesquite and other exotic wood pieces, many adorned with inlaid turquoise. The mesquite pieces are hand carved and are available with either a more natural “live” edge or a “finished” carved edge. As always, Out West offers pieces with unique and organic materials like saguaro ribs and desert sticks assuring each one is genuinely a one-of-a-kind. You’ll never see the exactly same piece in a neighbor’s livingroom or cousin’s guest bedroom. At Out West Interiors, shoppers can outfit an entire room … or a whole house. It’s not only furniture, which includes their specialty leather sofas, buffets, dining tables/chairs, head/foot boards, coffee tables, benches, end tables, but also endless accessories. Hand carved wooden Indians are much sought after in Arizona. The Sextons also found an artist who crafts mirrors with vintage cowboy boots! There are lamps, window coverings, even leather handbags. Out West continues to cater to its loyal following as well as cultivate relationships with new neighbors. Remember, Out West is open seven days! Stop in at 38252 W Jaqueline Dr., keeping in mind that because they are off the proverbial beaten path (i.e., NOT in Scottsdale! ), pricing is competitive. Visit outwestinteriors.com for a preview or phone 480-575-8000 with questions.